Jambo Casino | A safari adventure with popular slots & big bonuses! Join the Jambo safari adventure! Jambo Casino is a brand new online casino. It is also the latest online casino that the Casino Viking has visited. He found out many things about this casino that he is eager to share with his readers. This includes things like the UK Gambling Commission and the Malta Gaming Authority licensing this casino. The casino also uses the latest 128 SSL encryption software to keep private information safe. Not to mention that Jambo Casino fully supported both tablet and mobile devices. In the rest of the Vikings review, he will be sharing what he found out about the casino’s promotions, games and suppliers, payment providers, and technical support. As with most new online casinos, Jambo Casino offers new players a welcome bonus and then follows up promotions that can be claimed on further deposits. The first deposit welcome bonus comes with bonus funds that can be used to play games before using your own funds and free spins. The other promotions included bonuses like free spins and cashback deals. The Viking would like to remind players that as this casino is new its promotions may change over time. So make sure to check out the promotional page before signing up. The VIP program at Jambo Casino offers players better rewards and perks the higher your VIP level. This includes faster cash out, higher deposit and withdrawal limits and much more. At the time of writing this, the Viking found over 300+ games at Jambo Casino with more being added frequently. There are slots, live casino, and other games. The slot section is the largest which is no surprise as it is the most popular among online casino players. In this section, you will find games like Mythic Maiden, Fruit Shop, Chicken Fox, Spin Dizzy, Wild Plunder, Icy Gems, and more. The casino also offers live casino games for players that prefer the atmosphere that comes with being able to interact with other players and a host. 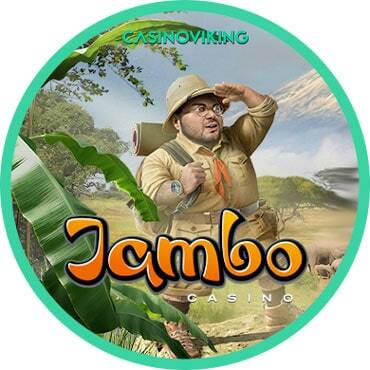 The games at Jambo Casino are supplied by the likes of Microgaming, Evolution Gaming, Pragmatic Play, Microgaming, Evolution Gaming, Pragmatic Play, Skillzz, WMS, and BluePrint. When looking into the payment methods at this casino the Viking found a whole page dedicated it. This made finding out about which payment methods they accept very. It also means you do not need to look hard for the terms and conditions for each method. They accept Visa, MasterCard, Sofort Banking, Skrill 1-Tab, Neteller, EcoPayz, Eps, PaySafeCard, EntroPay, and many more. Jambo Casino also likes to take good care of its customers by offering them a lot of support options. They have an FAQ, live chat, telephone, and email support. Overall the Viking liked everything about this casino. He loved the fact that it comes in 3+ different languages and 5+ currencies. The casino is also very user-friendly and easy to navigate which is great for mobile and tablet devices. So why not follow the Viking to this brand new online casino. Simply click on the link above and sail there now.